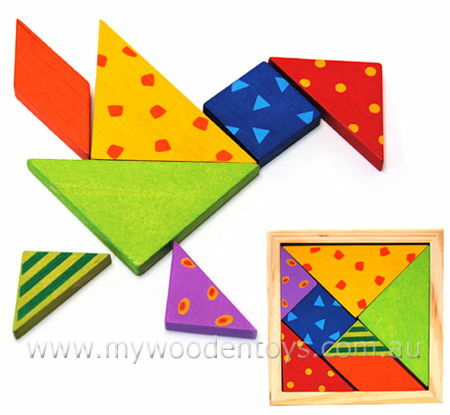 Mini Wooden Tangram Puzzle is a colourful version of a game which has been in existence for centuries. The puzzle is a square cut into seven shapes called "Tans" the idea is to try and make pictures with the 7 shapes without leaving any out or overlapping them. This little game comes in a wooden tray and has brightly coloured and patterned pieces. A simple look for Tangram on the internet will give you plenty of ideas for the many shapes you can make with this simple but surprisingly challenging little game. Size: Tangram in a square is 11 cm by 11 cm. Material: Wood, Child safe paint. Age: 3+ Game for all ages. We like this because: "Play with this for a bit and you will see why it has been around for so long."